For the next 40 days, your financial gift has twice the impact. A group of generous SECU Family House friends and volunteers will match every dollar you donate to our Annual Fund until November 20. Our goal is to fund all 40 rooms for the entire month of December – easing burdens for families who travel far from home to UNC Hospitals for medical care. You can help reach that goal! Please respond by November 20 – and double the difference you make! Your donation bridges the gap between our relatively low room rates ($45 and $60) and our true cost of daily operation, which is $95 per room. 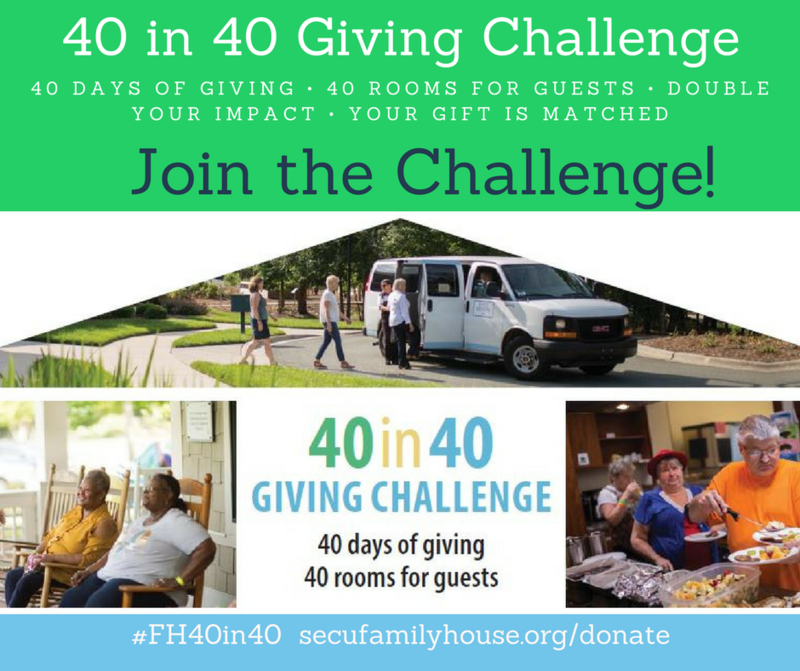 The goal of the 40in40 Giving Challenge is to raise $114,000, which will cover the cost of all 40 rooms for the month of December. Thank you!